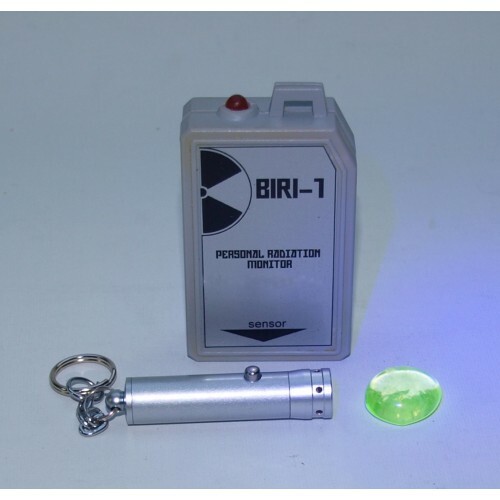 If you thought the Biri-1 keychain dosimeter was a great little gadget, we've just made it even better! We now have a limited number of boxed outfits available, so your Biri-1 will always be ready for action! This fully functional radiation monitor is tiny, and surprisingly sensitive. They were manufactured in the former Soviet Union, in the wake of the Chernobyl accident and built using military grade components. We have secured a small stock of un-issued Biri-1s, released from storage and in virtually as-new condition. 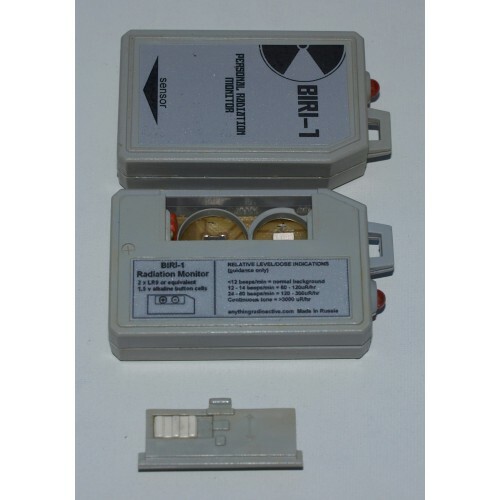 They are really easy to use: there's just one on/off switch on the back of the battery compartment, and two indicators. When it is switched on you'll hear a soft tick, that lets you know it is working, and when the miniature Geiger Müller tube detects Beta, Gamma or X-Ray radioactivity there's a louder bleep. 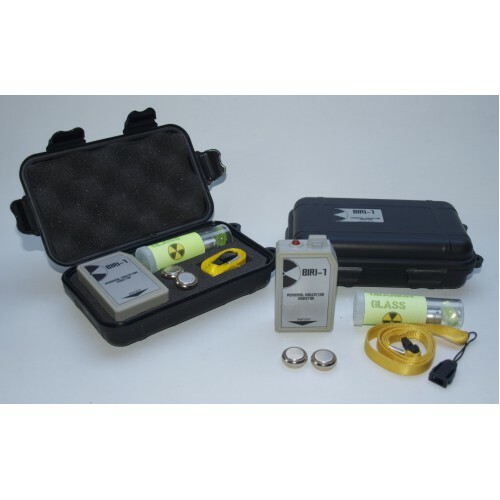 The number and rapidity of bleeps per minute provide a good guide to the levels of radiation. There is also an easy to understand chart on the back of the case, in English, that shows the number of bleeps for normal, elevated and dangerous levels. Typically you will hear several beeps a minute , produced by normal background radiation. 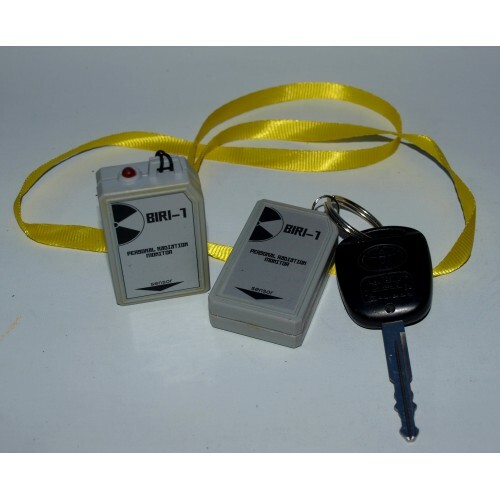 The Biri-1 is powered by two 1.5 volt button cells and a pair are included, plus you'll also get an instruction sheet in English and a copy of the original Russian user guide. Now, here's the good part. The Biri-1 outfit is housed in its own custom fitted waterproof case, with storage space for one of our distinctive neck lanyards, a pair of batteries and a SPECIAL BONUS EXTRA. That's right, we've also included a Uranium Glass Gem and a miniature Ultra Violet torch. Uranium glass contains a very small amount of uranium oxide - it's radioactive but don't worry, it can only be detected by very sensitive instruments. It's not enough to get the Biri-1 excited, though over time you might just notice an extra click or two. However, shine the UV torch on the gem and you'll see an eerie green glow, confirming the presence of trace amounts of Uranium. 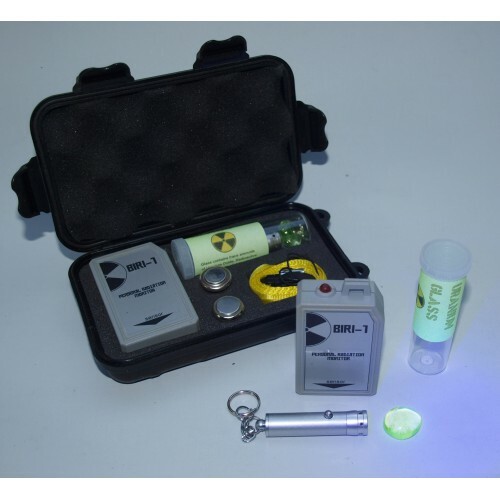 Supplied accessories: 2 x modern alkaline button cells, neck lanyard, instructions in English and Russian, compact waterproof action case, uranium glass gem, miniature UV torch (with batteries). Uranium glass is generally regarded as harmless and not subject to any special handling precautions, nor are there any restrictions as regards owning Uranium glassware (in the UK and most other countries). Nevertheless, Uranium glass gems, like any small glass object, should be kept well away from children, not because it is radioactive but broken glass can be very dangerous!